Anna and Baker are one of the sweetest couples. They came down from Washington DC to get married. 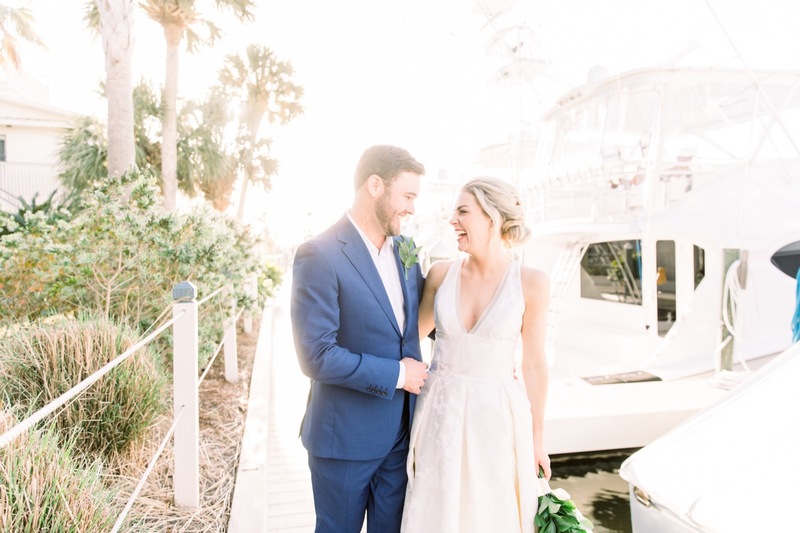 They vacation to Orange Beach, and knew it was the perfect location for their destination wedding. They love eating at Fishers Restaurant in Orange Beach, and they couldn’t imagine getting married anywhere else. There were a few hiccups to start the day, but even with those, they just laughed through them, and had the sweetest spirits. The rental company had a huge truck with the rentals for the wedding, and when they were pulling into their beach house, the truck got stuck, and blocked the driveway. As I was pulling into their house to start the photos for the day, I couldn’t get through because of the rental truck being in the way. I couldn’t tell that they were stuck, I just thought they were blocking the driveway… So, against my better judgement, I drove around the truck onto the sand, and got stuck as well. Not the best decision I have made. Not only is the rental truck stuck, and blocking anyone from coming in or not, their photographers are now stuck as well. We were only planning on taking photos for an hour or two at their house, and then the plan was to go to the ceremony site. So I was incredibly nervous as to how everything was going to turn out. Since the rental truck already had a tow truck on the way, it worked out just fine, and the tow truck was able to pull me out as well. Lesson learned…. never drive on sand no matter how packed down it appears. I loved being able to work with Tonia Turner again. She was the wedding planner, and it has been a few years since I have worked with her. She does a great job at keeping up with everything and is super organized. Fishers always looks beautiful, but on Friday it was exceptionally exquisite. The weather was literally PERFECT! We couldn’t have asked for a nicer day. And we got to do bride and groom photos during golden hour, and it was so dreamy. I don’t always get to do photos on wedding day during golden hour, so when I do, it is an extra treat. Anna and Baker looked like they belong in a magazine. They were so joyful, and it was a true delight to be able to photograph their big day. Their friends and family came down from all across the US, and that was a true testament as to the type of people Anna and Baker are.